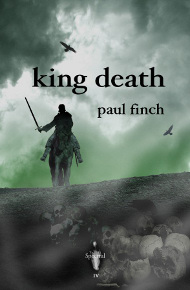 I must extend my gratitude to Paul D. Brazill for writing and sending me this latest review of Spectral Volume IV (Paul Finch’s King Death), which can be found on his You Would Say That, Wouldn’t You? blog. He calls Spectral Press “… an impressive indie publisher…” and he gives the latest chapbook a thumbs up, but to find out exactly what it is he wrote in his review, you’ll just have to go ahead and click here. Naturally, any publisher worth his salt doesn’t like to stand still for too long, even with something as well-established as a successful chapbook line. To that end, I have been toying with the idea of including one evocative drawing in every chapbook, to illustrate and encapsulate the mood of the story, starting with Spectral Volume V, due in March 2012. This will be a great chance for any artists out there to get involved with the imprint and its onward growth – so, if there are any budding Da Vincis out there, please contact Simon Marshall-Jones on spectralpress[AT]gmail[DOT]com. On a related theme and much further down the line, I will be holding a cover art competition, doing much the same thing for artists that the current SpectralPress/Read Horror short story competition is doing for writers (see the details of that competition here). I am looking to hold the art contest sometime in the latter part of next year, so keep a lookout for that. So, as always, onwards and upwards! !